Acacia implexa Benth. is an erect tree up to 15m tall, single-stemmed or divided near ground level into 2 or 3 main stems. Leaves dark green, narrowly-elliptic and sickle shaped, 7-20 cm long and 6-25 mm wide, much narrowed at the base. 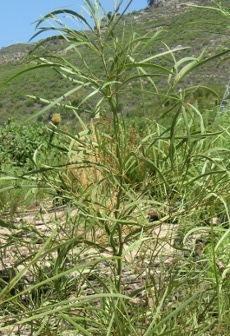 Bi-pinnate leaves may persist on young plants. Bark rough and greyish. Flowers arranged in globular heads, creamy to pale yellow, flowering from December to March. Pods narrow, coiled and twisted to 25 cm long, 4-7 mm wide. Seeds dark brown, longitudinal, fleshy tissue growing from the point of attachment of a seed. Screw-pod wattle is native in Australia. Acacia implexa has been recorded in the Western Cape at Tokai forest, Stellenbosch and Wolseley. Screw-pod wattle is a fast growing tree and invades agricultural lands, planted forest and disturbed areas. It can become highly invasive if not controlled. Screw-pod wattle spreads through suckers (side shoots or underground runners generate at the base of the tree). Currently control is by uprooting the plant. 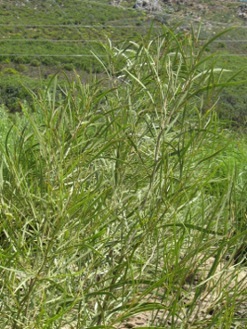 There are no herbicides registered for this species in South Africa.